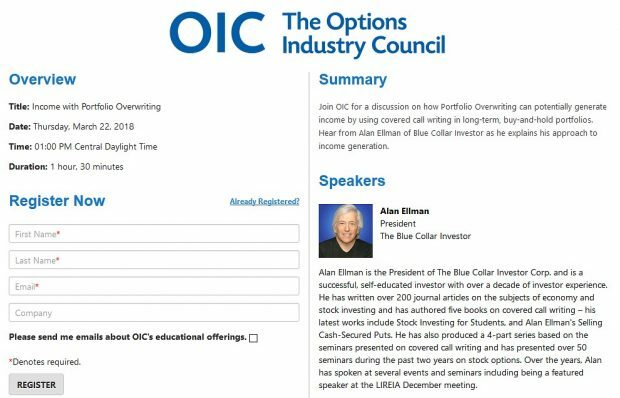 An integral part of understanding option trading basics, is mastering the components that influence option value. Many option traders will look to make money as a result of a discrepancy between an option’s current market value and its theoretical value. In other words, is the option overpriced or undervalued? If, for example, an option is calculated to be underpriced an investor will purchase it and look to sell it when market forces return it to the higher, more appropriate value. An analogy would be if you found a real estate property on sale for $100k in an area where similar homes were selling for $120k…buy low and sell high. In order to utilize this approach, we would first need to determine the theoretical value (a mathematically derived estimate of the value of the contract) of the option to determine if it is priced fairly. Many companies do in fact distribute dividends which may impact call premiums. One way to adjust the model for this would be to subtract the discounted value of a future dividend from the stock price. Even though the original Black-Scholes model does not take dividends into consideration, an extension of the Black-Scholes Model proposed by Merton in 1973 alters the Black-Scholes model in order to take annual dividend yield into consideration. This model is not as widely used as the original Black-Scholes Model. The model assumes that the option can only be exercised on the expiration date. We, in fact, use American style options which allow the option to be exercised at any time during the life of the option, making American options more valuable due to their greater flexibility. This limitation is not a major concern because very few calls are ever exercised before the last few days of their life. This is true because when you exercise a call early, you lose the remaining time value on the call and collect only the intrinsic value. This assumption suggests that people cannot consistently predict the direction of the market or an individual stock. The Black-Scholes model assumes stocks move in a manner referred to as a random walk. Random walk means that at any given moment in time, the price of the underlying stock can go up or down with the same probability. The price of a stock in time t+1 is independent from the price in time t.
Usually market participants do have to pay a commission to buy or sell options. Even floor traders pay some kind of fee, but it is usually very small. The fees that individual investor’s pay is more substantial and can often distort the output of the model. U.S. Government Treasury Bills 30-day rate can be used since the U. S. government is deemed to be credible enough. However, these treasury rates can change in times of increased volatility. The Black-Scholes model assumes that markets are perfectly liquid and it is possible to purchase or sell any amount of stock or options at any given time. This assumption suggests returns on the underlying stock is normally distributed, which is reasonable for most assets that offer options. 1) As the stock price rises, the call value rises and the put value falls and vice versa. 2) As volatility rises, call and put value rise and vice versa. 3) As we approach expiration Friday (time passes), call and put value fall. 4) Rising interest rates will cause calls to increase in value and puts to fall in value and vice versa. When interest rates are high it costs more to buy the stocks (cost of carry) and therefore calls become more desirable. 5) As dividends increase, call value declines and put value increases. One standard deviation away from the mean in either direction on the horizontal axis (the red area on the above graph) accounts for somewhere around 68 percent of the potential price range. Two standard deviations away from the mean (the red and green areas) account for roughly 95 percent of the price potential. And three standard deviations (the red, green and blue areas) account for about 99 percent of the potential prices. The method used by most options traders to determine the theoretical value of an option is the Black-Scholes Model. Certain parameters are fed into the equation and several assumptions are made to calculate the figure. It is important to understand the strengths and weaknesses of this model as we apply it to our investment strategies. For covered call writers it is more important to understand the relationship of the parameters to option and stock value rather than actually calculate theoretical value which is of more value to the traditional options trader. Consumer credit increased $11.4 billion in September, better tha analysts’ expectations. This may be the result of over 300,000 jobs created the past two months. For the week, the S&P 500 declined 2.4% for a year-to-date return of 11.8%. BCI: This site is taking a conservative and cautious approach as we wait for the debate over the fiscal cliff. We are using in-the-money strikes, low beta stocks and ETFs. Those new to investing with stock options may want to keep some cash on the sidelines. The Weekly Report for 11-09-12 has been uploaded to the Premium Member website and is available for download. On a separate note, Alan presented to the Chicago Area AAII, one of the largest AAII chapters in the country. Early reports were that his presentation was “sensational” and The BCI Team made a lot of new friends in the Chicago area. Alan great article. There is also a great article imbedded in the home page of ivolatility.com called “Putting volatility to work” which is very good and touches in more detail on what is included here. The article includes a discussion specific just to covered call writing. In your system do you look up any of the “Greek” statistics before using an option? I have read that the greeks are important as they relate to option trading. Thanks for everything. It is NOT necessary to look up “Greek” stats for covered call writing. However, it is critical to understand the relationship between share value, time decay and volatility as they relate to option premium and risk degree when using this great strategy.